Orientation. Evaluation in the Planning Process. Spatial Impact Analysis as a Tool in Evaluation Research. Assessment of Priority Weights and Preferences. Discrete Multicriteria Methods. Continuous Multicriteria Methods. Specific Issues Regarding Policy Analysis. Case Study: The Location of Nuclear Power Stations. Case Study: A Multi-Objective Planning Model for Regional Economic - Environmental - Energy Interactions. Case Study: Locational Strategies for Industrial Sites. Case Study: A Multicriteria Location Analysis of Future Gravel Pits. Concluding Remarks. References. Index. Appendices. 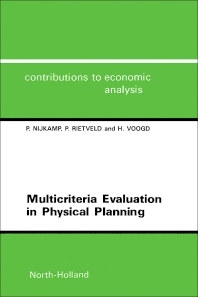 The aim of this book on the use of multiple criteria analysis in physical planning is to synthesize most of the relevant work in this field. Its first objective is to provide a concise and systematic overview of the state of the art in the area of multiple criteria analysis, with a strong emphasis on practical use and planning. Secondly, this book attempts to show the wealth of potential applications of multiple criteria analysis by providing a presentation and discussion of various real-world uses of multiple criteria decision-making in the practice of physical planning. The book is mainly intended as a textbook for practitioners in the field and for students in the areas of (physical) planning, regional and urban economics, geography, transportation science and environmental management.